Here are a couple quick ideas on maintaining Act!, which can be automated from the Act! server also by going Tools -> Act! Scheduler. Go to File -> Backup. Do this early and often! We have recently been informed that an embedded third-party software component (Protexis license service for Act!) for legacy versions (listed below) of Act! that facilitates licensing services is being discontinued by the publisher (Arvato) on December 31st, 2018. As of January 1, 2019, certain common actions Act! users may take that interact with the licensing component will cause Act! to fail and you will no longer be able to access your database. For a complete list of actions, click here. If you are on a legacy version of Act!, and you wish to continue using Act!, you will need to upgrade. Versions that will have a patch issued between November 20th, 2018 and January 10th, 2019. Although many Act! 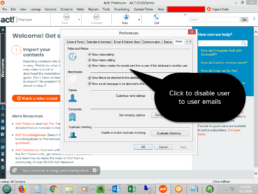 users like e-mails attached to Act! records, they may not want internal e-mails to attach to Act!. Click the image to see a video on how to disable Act! from attaching internal e-mails. To see the screen below, click on Tools -> Preferences -> Admin to get to this screen. If this option it’s disabled, login as the Act! Administrator. Act! Premium for Web v20.1 update 7 had issues arbitrarily kicking out users of the database. This was solved rolling back to update 5 on the web server, but Outlook integration still had issues. Our hosting partner found this update works for the local workstations. Here is the user guide on how to configure the software. It’s a best practice to uninstall the previous version of the integration tool before installing this. Press “log off” instead of using the “X” on the browser window instead. Usage of the “X” in the top right corner of the browser app will close the browser, but does not close the Act! Premium for Web application’s session on the server. Hence, so the session counts down anyway. When that countdown hits the end of the 20+ minutes, Act! closes the session and any other sessions that the user may have open at the time. Use of cut and paste from MS Outlook and web pages into notes and history. By doing this, there is a likelihood that mismatched HTML code embedded in the text causes the browser to choke and kick out the user. If you need to paste data from these sources, paste as text to eliminate the embedded HTML. In other words, from Outlook, you would copy the message to notepad; then, to Act!. That eliminates the variable, but you lose some formatting.